What happens when you take an Author, Producer and Gym Owner and place them in front of a microphone and tackle topics that range from entrepreneurship, entertainment and numerous things in between? 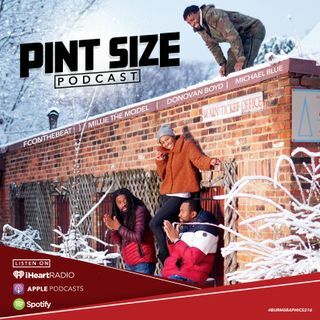 Welcome to The Pint Size Podcast with your hosts Michael Blue, Donovan Boyd, and FcOnTheBeat. Another way to support the show is to ... See More subscribe to the podcast and leave us a review on ITunes to keep us ranking strong on Podcast charts. Like us on FaceBook! Explicit Episode 66 - "Evolve"
Explicit Episode 64 - "You Ain't Wavy Tho!" Explicit Episode 63 - "Bank While You Can"
Explicit Episode 62- "How Do You Want It?" Explicit Episode 61 - "Is I'm Done?" Explicit Episode 60 - "Lyrical Jargon"
Explicit Episode 59 - "It's Just Different"
The Marketing Minute W/ Donovan Boyd- "Life Balance"
Explicit Episode 58 - Surviving "Surviving R. Kelly"